What is involved with a veterinary cardiology work up and how much will it cost? The veterinary cardiology work up consists of getting a complete history and a cardiac physical examination along with additional diagnostic tests as indicated, so fees vary from case to case. We will discuss all fees prior to and during treatment. What does an Echocardiogram show that an X-ray doesn’t? Although X-rays (radiographs) are an important diagnostic tool, an echocardiogram provides live images from which the cardiologist can measure the size and thickness of the greater vessels, the chambers of the heart and heart valves as well as track the flow of blood through the heart and vessels. A radiograph is a still picture that can be used to determine chamber and vessel enlargement, accumulation of fluid and other cardiac abnormalities. Radiographs allow evaluation of the lungs which an echocardiogram does not. I already had radiographs and blood work done at my family veterinarian’s office; will you need to repeat them? In many cases we will not have to repeat the diagnostics done by your family veterinarian, so it is always good to bring these with you to your appointment for evaluation. However, this varies from case to case and we will provide you with an estimate for the diagnostics needed to properly evaluate the condition of your pet. What kind of procedures does the cardiology department do? 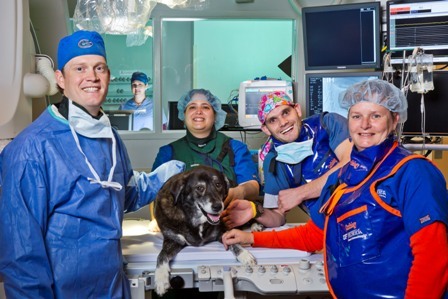 Here at the UF Small Animal Hospital we are equipped to perform echocardiograms, electrocardiograms (ECG/EKG), balloon valvuloplasty, pacemaker implantation, transarterial patent ductus arteriousus closure, blood pressure monitoring, OFA heart certification, Holter and event monitoring, pericardiocentisis and surgical heartworm extractions. We also have bi-monthly cardiomyopathy screening clinics as well as veterinary clinical research trials for new treatments and surgical procedures. Can I go to my family veterinarian for the follow up exams? In many cases, your family veterinarian will perform follow up exams, blood work and radiographs with phone consultation from the cardiology service. However, there are some cases that will need to have the cardiologist and or the equipment here at the UF Small Animal Hospital to perform the follow up care. How do I know if my pet qualifies for a clinical trial? Your family veterinarian can help you determine if your pet qualifies for one of our clinical trials by consulting with the cardiology service. My family veterinarian recommended that my pet wear a Holter monitor; why can’t we just do an ECG? An ECG only records a few minutes of the heart’s rhythm in which case an abnormality could easily be missed. The Holter monitor records every heart beat over a 24 hour period of time. The recording is then evaluated by the cardiology technicians and the cardiologist. The results are then used to help determine the diagnosis, treatment plan, as well as response to current medical treatment. How old does my pet need to be to get a heart certification? Many breeders want to have their puppies screened for congenital cardiac defects before they are sold in which case the cardiologist will sign a “provisional” certification. Otherwise OFA certification is performed when the dog is at least 1 year of age. Do I need a referral from my veterinarian? A referral from a family veterinarian is not required; however we would prefer to work with your family veterinarian to provide you and your pet with the most comprehensive veterinary care. Can you be my family veterinarian? Because our service is so specialized we are unable to offer your pet the general care that your family veterinarian can. If you need a family veterinarian the UF Veterinary Hospital has a general practice that operates within the hospital that can provide your pet with vaccines, flea and heartworm protection and all other general medical needs. Will my pet be sedated? Do I need to fast him/her? Although it is not very common, sedation may be necessary for certain procedures. It is recommended that your pet does not eat after midnight the night before your cardiology visit. However, if you pet is on any medications, it is important to give the medications at the normal scheduled times. Water is always okay up until the cardiology appointment. Please call us at (352) 392-2235 if you have any questions or concerns.